Sprintly is able to monitor your GitHub or Beanstalk or Bitbucket (or any SCM/VCS) repository for code commits to repositories related to your products. This enables for deep ticket management integration that can be triggered by your coders via git, svn, or hg commit messages. In other words, a programmer can do git commit -m 'Changed error message color to red. Fixes #33.' and Sprintly will dutifully mark that item as complete when said programmer pushes that code to GitHub. All commit messages that contain a recognized command will be attached to the tickets mentioned in the commit message as a type of comment. You can tell code commits from comments by the icon next to them. Code commits have a gear icon and comments have a speech bubble. You can issue commands, such as closing or referencing a ticket, from commit messages. All code commit messages will be formatted in Markdown. Ticket numbers in commit messages are automatically linked to the ticket. Make sure that all of the commiters to your SCM repositories on your preferred service are using the same email for both their SCM accounts and their Sprintly accounts. This includes the email used with the config --global user.email [email address] command when you setup your Git repository locally. When commits are sent to Sprintly from your preferred SCM service they include your email address, which we use to save those commits under your Sprintly user. Otherwise, you'll need to authenticate with Github via the user profile page and we'll pull down any alternate email addresses you have on file with them. Do not add more than one Sprintly post-receive hook to a single SCM/VCS repository. This is because two products could both have a ticket #2 and Sprintly wouldn't know which ticket from which product to attach the commit message to. You can, however, add a single Sprintly post-receive hook to more than one GitHub repository without issues (e.g. Add the post-receive URL for "My Product" to the GitHub repositories for the Android and iOS applications). 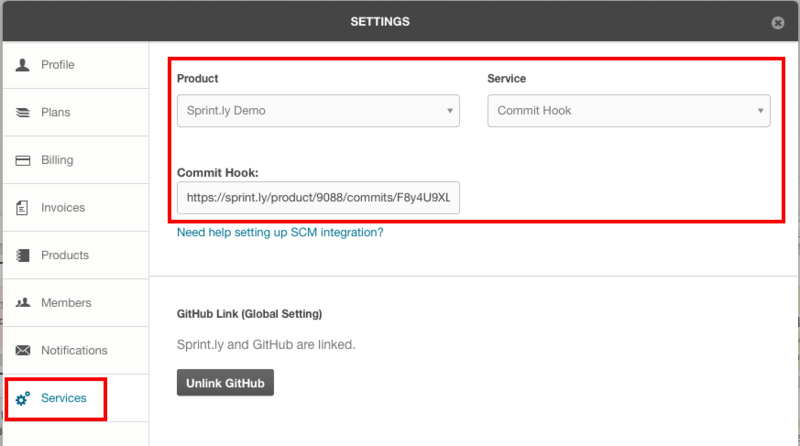 First locate the commit hook for your product in the Services tab of your Sprintly settings. Select a product from the Product pull-down menu and select Commit Hook from the Services pull-down menu. The post-receive URL will look something like https://sprint.ly/product/1234/commits/f1d2d2f924e986ac86fdf7b36c94bcdf32beec15. Copy the URL and then head over to your preferred SCM provider (Currently, we support GitHub, Beanstalk, and Bitbucket). Go to the GitHub repository you want Sprint.ly to monitor for commits and pull requests. Click "Add webhook" on the top right. Paste the Sprintly URL into the empty Payload URL field. Under "Which events would you like to trigger this webhook? ", select "Let me select individual events." Check "Pushes" and "Pull requests"
Click on the "Setup" tab at the top. Click on the "Integration" tab below the "Repository Setup" header. Choose "Webhooks" from the list of services on the left. Paste the Sprintly URL into the empty URL field. That's it! Sprintly is now monitoring your commits from Beanstalk and ready to do your bidding. NOTE: It doesn't appear as though Beanstalk supports multiple webhooks to be attached to a single repository. We do not know of or have a workaround if you would like to add Sprintly when you already have a webhook activated. Click the "Admin" tab for the repository. Click the "Services" tab in the "Repository details" list. Choose "POST" from the service list and click "Add service" button. Past the Sprintly URL into the empty text input labeled "URL". That's it! Sprintly is now monitoring your commits from Bitbucket and ready to do your bidding.